Do your kids need math fact practice? I know my little ones sure do! I was very excited that the Schoolhouse Review Crew was given the opportunity to review the MathRider program for grades 2-6. Does the idea of going on a quest to find a magical object appeal to your children? Does mastering addition, subtraction, multiplication, and division facts for numbers 1-12 appeal to you? Read on! MathRider is a downloadable software (for both Windows and Mac operating systems, with free updates for life) for $47.00. 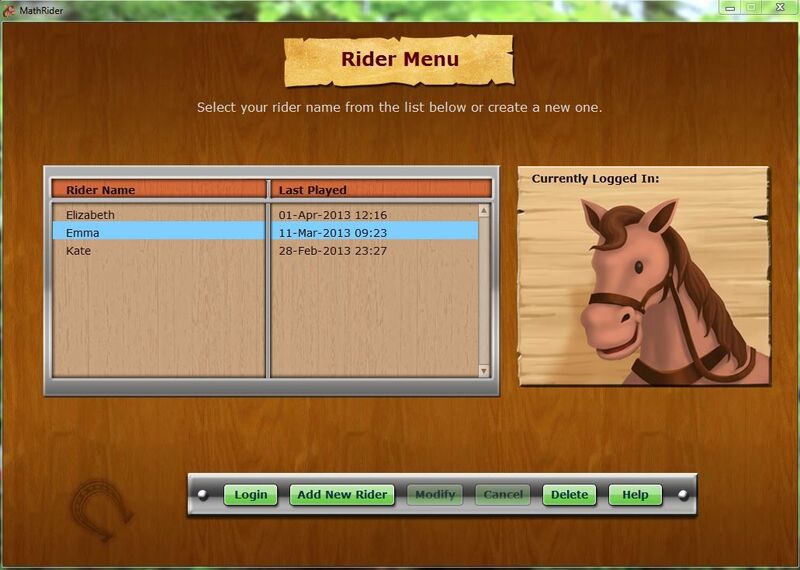 Once you have downloaded the software, and loaded it onto your computer, you will go to a Rider Menu. Right away I liked that it was not busy and full of flashing lights and distractions. It is a simple scene of natural beauty and from here you can do many things. It is important to note that MathRider assumes that the teaching of the math facts is done outside the program. 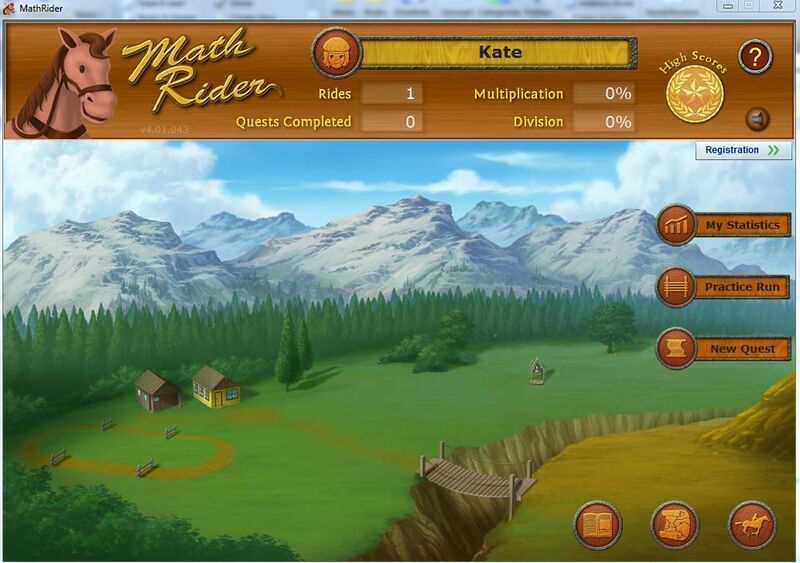 This is a program for math fact mastery. As you can see, you have a lot of control over how many problems you want your children to practice, which operations; including the number range. Once you have selected what you want, you just click, "Ride" and it begins. 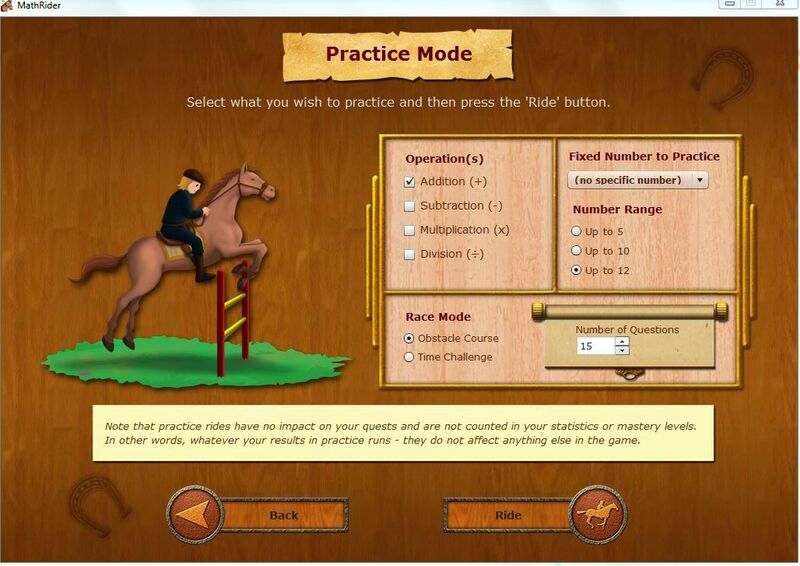 I like that Practice Run is offered so that when a child works on their quest, they do not get discouraged if their rider cannot answer the math fact questions quickly enough. Your child is taken into a land of fantasy and quests. Living in the Land of Ray and riding a horse called Shadow, he or she will set out on various noble adventures. Riding across amazing, digitally matte-painted moving backdrops of distinct fantastic lands, they will accomplish their quest, be it finding magical flowers, returning gems to the elves or even rescuing a princess! 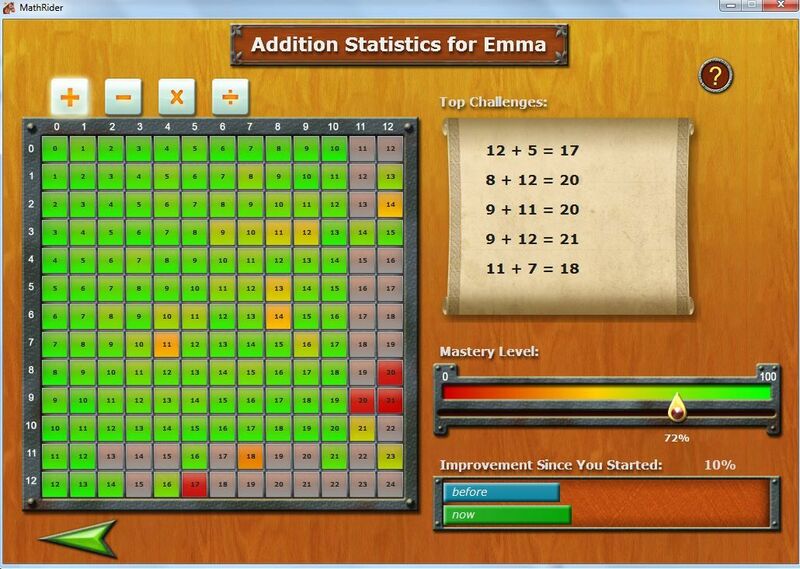 Each operation (addition, subtraction, multiplication and division) contains four quests, ranging from easy to master. The four quests are the same across the four operations, however, the rewards are not. 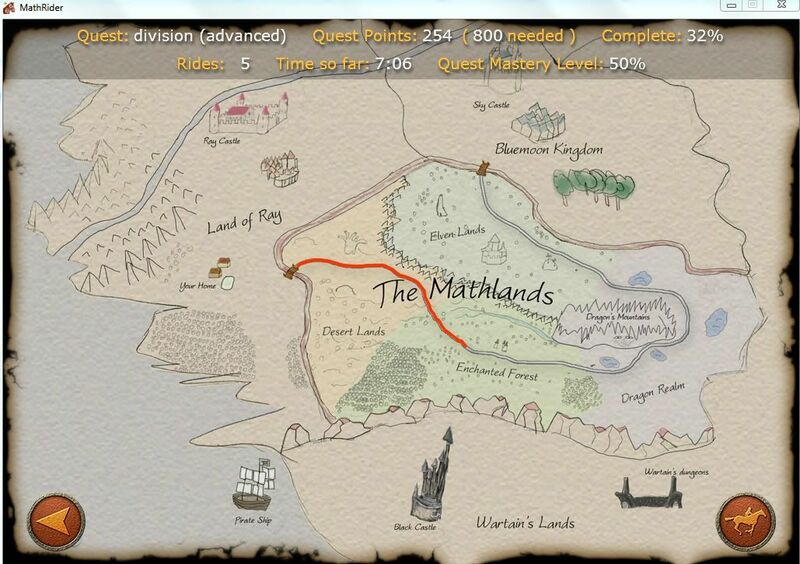 Every combination of quest and reward holds a different reward. 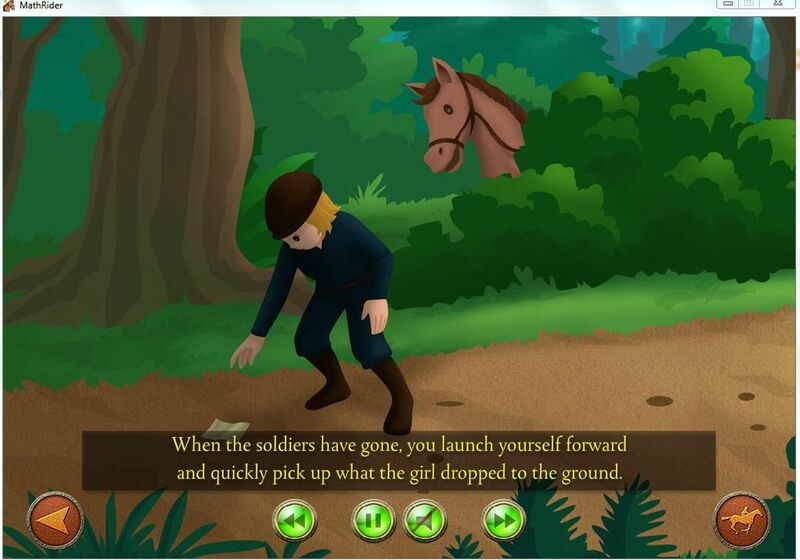 The rewards are all animated according to how well the player answered the questions. You can see how well your child has done and what they need work on. 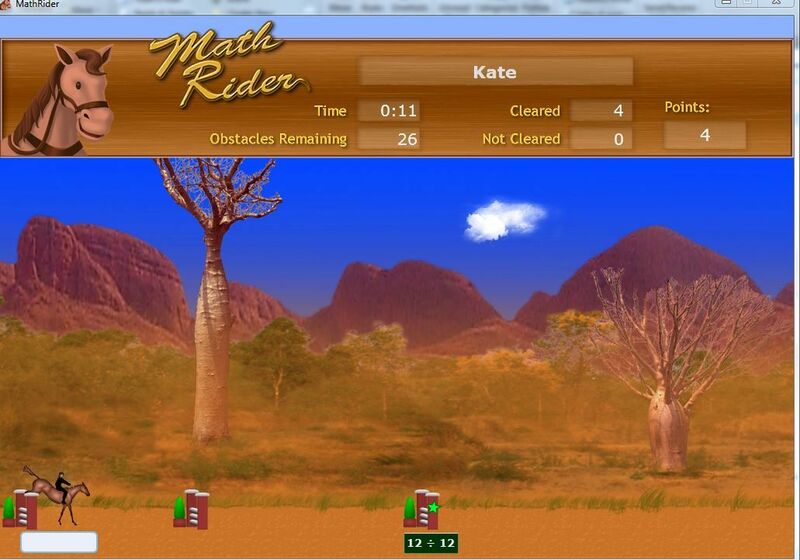 I had two of my children doing this program and each one of them has improved in their math fact retention. One of them (above) has almost mastered this section and will move on once she has. She will also receive the "Master" reward (prize) within the game that is only obtained and shown on-screen to the student when they have done so. I am extremely pleased with this program. I love the simplicity of it, the calm and friendly graphics, and the manner in which my children are learning their math facts and enjoying it. They don't complain about this program, and actually like using it. 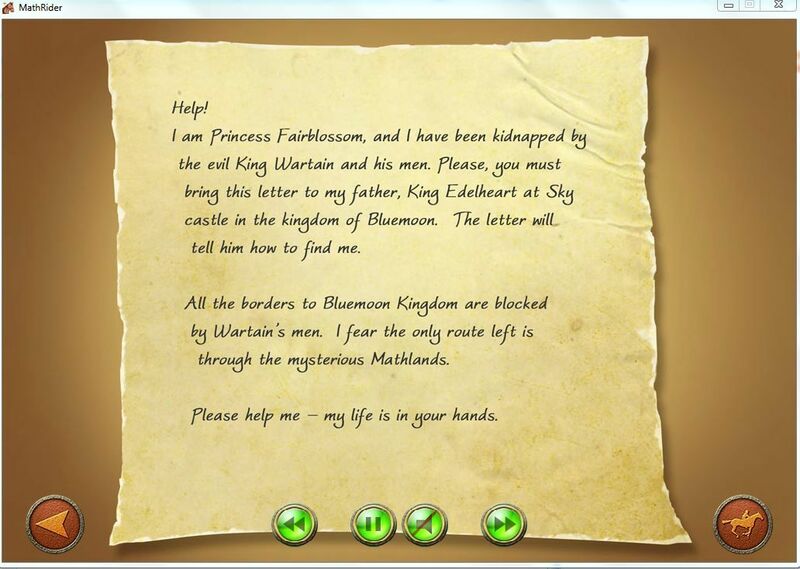 They will even go beyond what I have asked of them because they want to finish their quest and see what the reward is! This is high praise to me for a math program. If they enjoy learning and are retaining the math facts--what more can I ask, right? To read what the other Schoolhouse Review Crew families has to say about MathRider, click the link below. What I'm thinking: How fast time flies for the time we have with our children. I know I talk about this a lot, but wow, it is hitting home over and over these past few weeks! My oldest child is taking her assessment exams today for college in the fall. I am so proud of her and can't believe that the person I see before me at 18 was the baby that we welcomed so many years ago. It has been an honor seeing her grow. What I'm reading: I am reading The Fall of Anne Boleyn: A Countdown. It is a non-fiction writing about her life, and about the lives of those that surrounded her; both those that loved her and those that wanted her dead. What we're learning: We have started back up with ancient history and are now settling into Egypt for a while. I really enjoy ancient cultures and Egypt holds a fascination for me and always has. I don't see myself ever visiting there in my lifetime due to the chaos that abides in the land, but I am grateful for videos and good books that give me a taste of it. What I'm watching: We have been watching Elementary. It is a show with Sherlock Holmes in the US with Lucy Liu. We are enjoying the observation skills he showcases. I cannot vouch for all the subject matter, but the form behind the substance is worth understanding. I mix it up as instructed, after doubling the chicken, and then I add a ton of veggies to it. It is just SO good! I have made it from scratch too, but this comes together in less than an hour and that is very helpful in my busy homeschool house! I also discovered a cilantro sauce that I am going to write about soon. 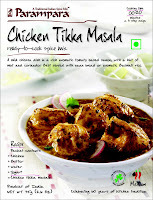 It is a wonderful addition to almost any kind of meal from soup to burritos! What I'm thankful for: The privilege of homeschooling my children. 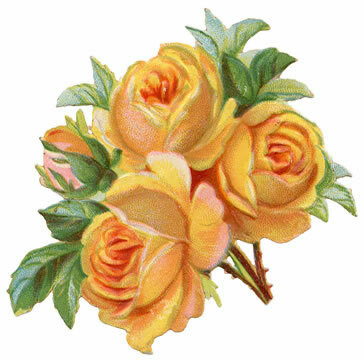 It is not as easy life, but it is a life I am very grateful for. What I'm praying: I am praying that my children walk with Christ; that they find their place in His kingdom and world, and that they know they are loved and an important part of His church. What we did this last weekend: We had a busy weekend! Saturday was spent doing house clean-up, gardening, running children around, and all around general Saturday stuff. Sunday was spent at church and then at a friend's home where we are always welcome and the fellowship is sweet. A picture to share of early spring in the corner garden with mint, gladiolas, snap dragons, and a whole lot of seeds and weeds coming up from the ground. When I began this thing we like to call parenting, it all seemed very, oh, I don't know - easy or simple or something. I knew that having a baby would change my life--in my head. I did know that and sort-of understood what it meant. Sort-of. I really had no idea at all. Now, after 18+ years of parenting, I sometimes feel I have something to say about what it means to be a parent, but I still feel woefully unprepared for the changes it brings to my heart. I think about how very simple it actually was when my children little. However crazy and wild and seriously sleep deprived those days were, they had a simplicity that I missed when I was in them. I wanted more and had a hard time appreciating the crazy for what it was. I look at some of the younger mothers in my life now and I think - oh, don't rush it. Don't long for what is to come because it comes so much faster than you think it will. You will have those older children very quickly. I want to make one thing very clear - I absolutely LOVE having older children. I adore my teens and cannot believe how amazing my older children are. How did that happen? To God be the glory! But. It went very fast. I wanted it to go fast, but I didn't know what that meant when I wanted it. I would not turn back the clock because that isn't how life works - we move forward and this is good. Change is good and we birth our children and raise them only for a short period of time and give them to the Lord each day along the way. We raise them to be adults and then they grow up and become them. This is good and the way it should be. But. Some days, it feels like the speed of light. Some days the sadness at the speed of it and the fast changes that life brings overwhelms me. I wish to embrace what the Lord gives me each and every day. I want to rejoice in the beauty that I see around me in my family and the amazing young adults I am living with blossom before my eyes. I rejoice in my head - 100% - but my heart sometimes longs to look back and remember the tiny people that needed me so much. Does that ever happen to you? Mamas, love those children. They grow up so very quickly to become people you are terribly grateful to be friends with. I am terribly grateful today.